M44 baits and other devices left out by government agencies to destroy “vermin” like coyotes or foxes can pose unintended hazards when unattended children or pets investigate them. The M44 found by the teenager and dog in the article above was described as looking like a sprinkler head. M44 baits are small cylinders on stakes planted in the ground and baited with an attractive scent to encourage pest animals to “grab and pull”. 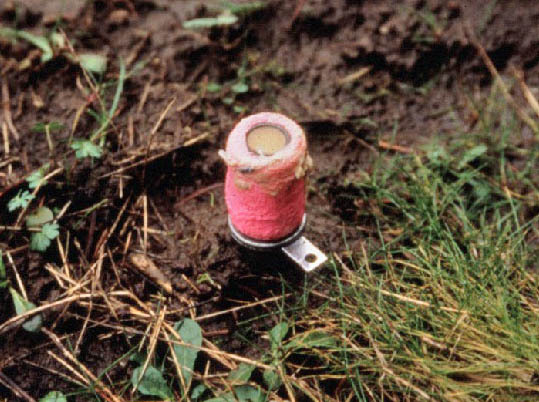 When an animal (or a child) interacts with the M44, the device releases a cloud of sodium cyanide powder, which reacts with moisture in mucous membranes to produce cyanide, which poisons the animal. According to the USDA fact sheet on M44s, these devices are only supposed to be used on property at the request of the property owner. M44s are often placed “along game and livestock trails, ridges, fence lines, seldom-used ranch roads, coyote and fox natural travel ways, rendezvous sites, and territorial marking sites/locations”. Signs in both English and Spanish are supposed to mark the general area where the baits are placed, but were not visible around the bait in this instance. The baits are used mostly in winter and spring. Here’s an incident from 2000, to name just a single example. PredatorDefense.org also maintains a list of M44 accidents. Multiple organizations have tried to get the devices banned, but a lack of public knowledge about the devices’ existence is hampering efforts. Walk your pets on groomed trails, in parks, or in open areas where you can see hazards before they do. A good “recall” command can help you keep your dog away from suspicious objects even if he or she is off leash. Teach your children to what M44s look like and how to read the “Danger” signs. Good news! In April, 2017, the USDA agreed to temporarily stop the use of M44 cyanide bombs in Idaho. Theoretically, all baits currently installed in Idaho have also been removed. Many groups are pushing for a nationwide ban as well. Of course, there’s no word on that yet.